Work to improve the intersection at Long Mile Road and Tarawera Road is now complete as part of the first stage of the Whakarewarewa Forest development. Following completion of the intersection work, contractors are on schedule to finish work at the entrance of Long Mile Road over the next week. The forest project is included in Council’s 2018-28 Long-term Plan and includes improved facilities in the Tokorangi Forest (Redwoods) and a new forest hub off Tarawera Road (on the way to Tikitapu). The development is a collaborative project between Central Government (through its Provincial Growth Fund), Rotorua Lakes Council, Ng?ti Whakaue, T?hourangi Ng?ti W?hiao, and CNI Iwi Holdings Ltd.
Council is managing an investment of $14.5 million to enhance the forest amenity and improve the experience for all users. Council allocated $7.5 million to the project in its 2018 – 2028 Long-term Plan with $7 million to be contributed by Central Government from its Provincial Growth Fund. The project will be completed over the next three years. Member of the Whakarewarewa Forest project team and Council economic development portfolio lead, Deputy Mayor Dave Donaldson, says it’s great to see the vision for the overall Whakarewarewa Forest project coming to life. He says feedback from the community has been overwhelmingly positive. “This initial work at Long Mile Road has really set the scene for what’s to come as part of the overall Whakarewarewa Forest project and locals and visitors I’ve spoken to are looking forward to seeing this progress. The first stage of the forest project, which began late February, involves infrastructure upgrades at Long Mile Road. Local company, Campbell Infrastructure Ltd, has been contracted to complete this work which includes formalising footpaths and shared paths (to improve safety), formalising car and bus parking, upgrading stormwater management, kerbs and channels, and improving the connection to Scion. 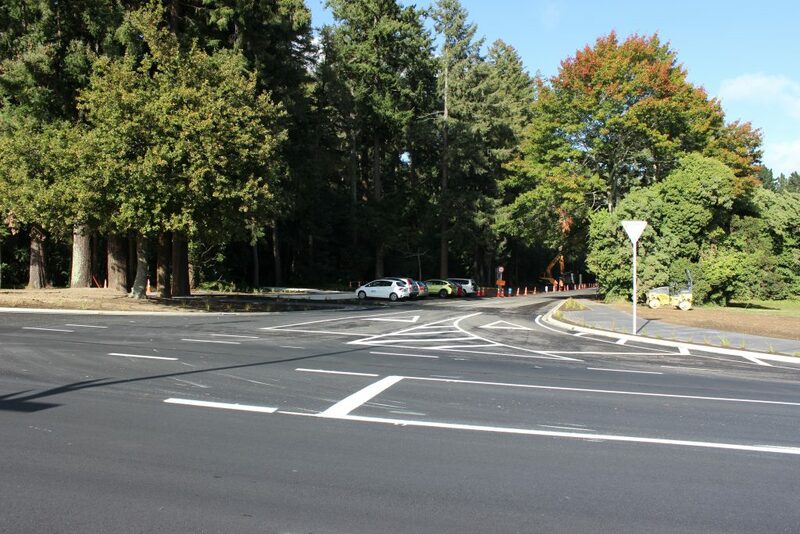 Initial work has involved improving safety at the Long Mile Road and Tarawera Road intersection by widening the entrance and providing dedicated turning bays for vehicles coming in and out of this busy intersection. Whakarewarewa Forest is a popular destination with both locals and visitors and more than 1000 people use Long Mile Road each day by. Prior to the upgrade, the Long Mile/Tarawera intersection was narrow and had limited road markings. The intersection upgrade was a priority for the project. Work done to date has included widening the road at the intersection to make space for dedicated turning bays for cars coming in and out of Long Mile Road which has also improved visibility up and down Tarawera Road. The bus stop area at the intersection has also been widened to provide for better visibility. The 3m wide shared path which has been started will extend down Long Mile Road, providing a safe and user-friendly pathway for pedestrians, runners, bike riders and other wheeled devices. The project team is really happy with progress to date and the quality of Campbell Infrastructure’s work. During the next week contractors will continue to extend the shared path down Long Mile Road and put the finishing touches on this initial section of work. Owner of B&B @ The Redwoods on Awatea Terrace, Vivien Cooper, says the development is a fantastic and timely initiative for Rotorua. “The forest is such a popular destination so I think the development is fantastic and makes a lot of sense. “My guests love visiting the forest but I have always been concerned they would find Long Mile Road dark and potentially dangerous with heavy traffic at times. The upgrade is looking sharp and will really contribute to safety and making this road more user-friendly. The next stage of the Long Mile Road upgrade will include progressing the shared path, formalising car parks around the Tree Archive dog walking park entrance, and beginning work to improve drainage. This will take place along the first 600m of Long Mile Road and is scheduled to start on Monday 29 April. Long Mile Road will remain accessible throughout the upgrade and effort will be made to keep disruption to a minimum. To keep up to date with progress at Long Mile Road and other forest developments visit rotorualakescouncil.nz/forestdevelopment. What else is happening as part of the Whakarewarewa Forest development? Establishment of another Forest Hub entrance including toilet and shower facilities, a 400 vehicle carpark, and event spaces. This is being established at the currently informal “black house” forest entrance area on the way to Lake Tikitapu, just past the first entrance to Okareka Loop Road. The creation of a forest loop cycleway which will become one of the New Zealand Cycle Trail’s Great Rides. In the future there will also be a cycleway connecting the forest hub to the city. Replacement of the current Visitor Centre with a purpose-built centre able to better cater to the more than 500,000 visits to the centre each year. The development of a cultural design overlay encompassing the entire project. This will be represented in the development designs, signage and storytelling to highlight the cultural identity of the forest and create a unique sense of place. How was the project selected? The opportunity to kick-start this project arose through the development of Central Government’s Provincial Growth Fund. Last year, with support from the landowners and mana whenua, Council took the opportunity to apply for the fund by selecting projects that were ready to be worked on and matched the p?tea (funding) criteria. The Provincial Growth Fund aims to lift productivity potential in the provinces, create jobs and enhance community benefits. The project is a collaborative effort. Council is working closely with the landowners CNI Iwi Holdings, and mana whenua T?hourangi Ng?ti W?hiao and Ng?ti Whakaue. Council will also be working closely with the Whakarewarewa Forest Managers, Timberlands Limited. As we progress, we will be working with wider stakeholders to consider how they would like to be involved and what opportunities are available to them. What are the roles of the Council and CNI when it comes to the forest? The Tokorangi and Whakarewarewa forests lands* are owned by Central North Island Iwi Holdings Ltd, following its 2008 settlement with Government. Council is responsible for the management of the Tokorangi Forest block under the terms of the Crown Forestry Licence (CFL). Council also manages recreation in the Whakarewarewa Forest under a management agreement with CNI and Timberlands who hold the CFL for the Whakarewarewa Forest block. Both CFLs expires in 2043 when full management and ownership will be returned to mana whenua iwi. Council is in the process of formalising a co-governance group for the Whakarewarewa Forest to support ongoing, sustainable recreational use, management and development in the forest. This group includes Rotorua Lakes Council, Te Komiti Nui O Ng?ti Whakaue, Tuhourangi Tribal Authority, CNI and Timberlands. *While this area is commonly referred to as the Whakarewarewa Forest, it is made up of both the Tokorangi Forest and the Whakarewarewa Forest. Tokorangi Forest is the Redwoods area and the Whakarewarewa Forest is the commercial forest that grows beyond this. Does the public get the chance to have their say on the project? This project was part of the Long-Term Plan consultation process which attracted hundreds of submissions. As work progresses, Council will continue to keep our partners, stakeholders and the wider community informed in a variety of ways including through our e-p?nui. Will the forest developments affect events and activities in the area? Council will work with event organisers and current activity concession holders to ensure they are informed and their activities can be provided for within the forest.